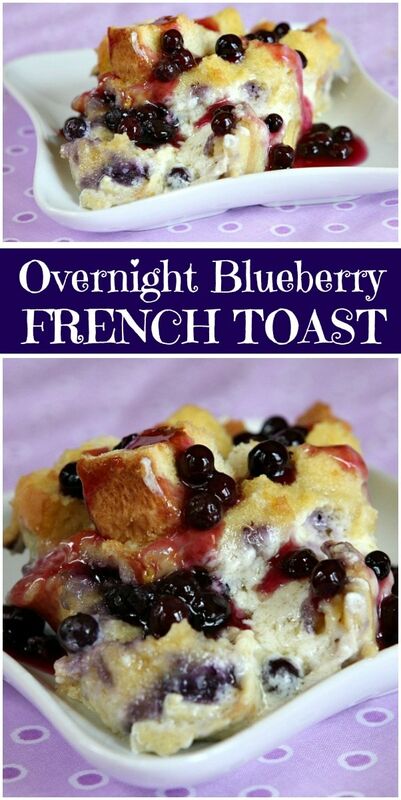 This Overnight Blueberry French Toast is the best overnight breakfast casserole recipe! Watch the video showing you how to make this recipe, then scroll to the bottom of this post and print out the recipe so you can make it at home. 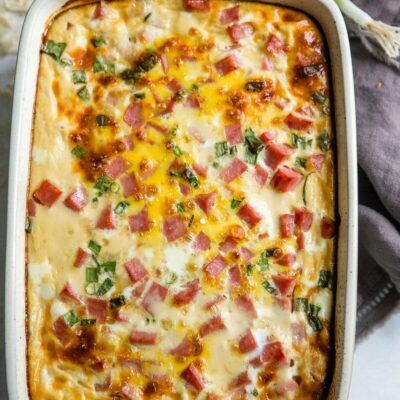 This is the best breakfast casserole recipe for a spring or summer brunch. Scratch that. You can make this one all year long! 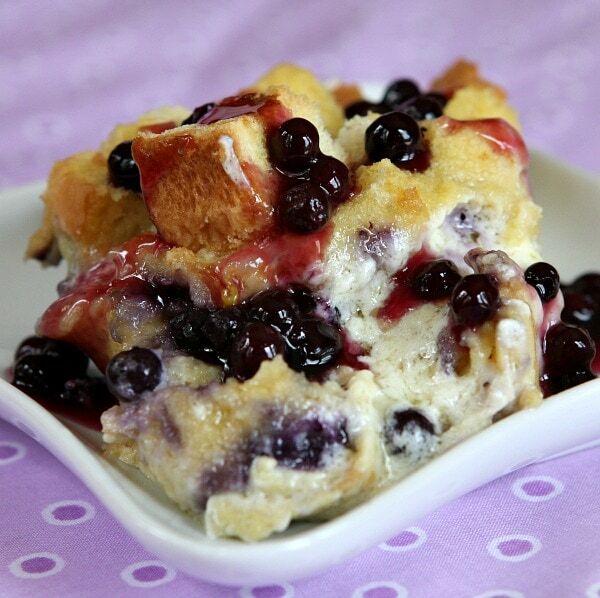 Of all of my breakfast recipes, Overnight Blueberry French Toast is a favorite in my house for Christmas morning. We make it the night before, refrigerate overnight, and then it’s so easy to pull out and put in the oven while we’re opening gifts! 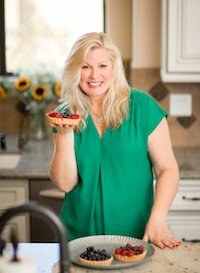 If you’re a true lover of blueberries, you might also like to try my Blueberry Lemon Scones or this Fresh Blueberry Coffee Cake. We love blueberries at my house! 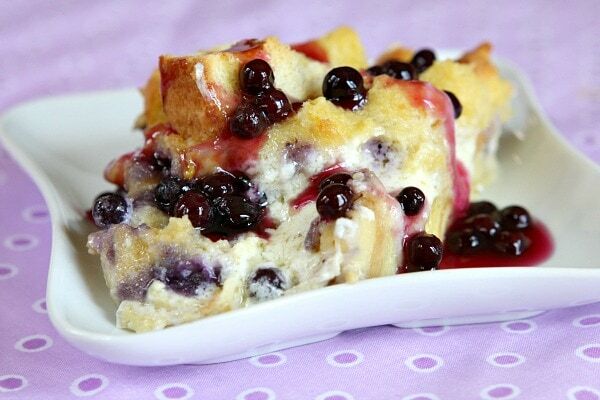 This blueberry overnight breakfast casserole recipe uses 3 key ingredients that make it awesome: challah bread (my favorite), mascarpone cheese (you can sub cream cheese if you’d like) and blueberries. If you cannot locate challah bread, it’s okay to substitute French bread. Start with adding cubed bread to a greased baking dish. 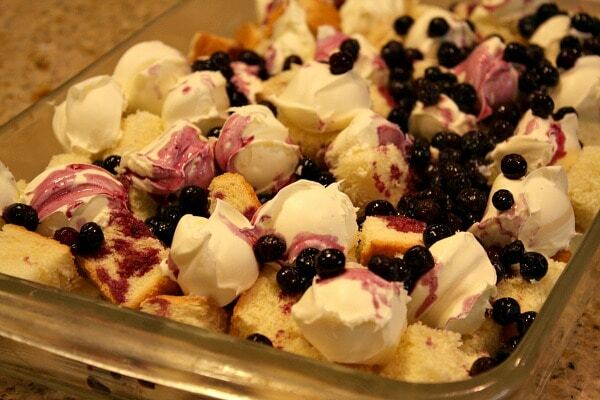 Top the bread with chunks of cream cheese and then blueberries. More bread is added on top of the cream cheese and blueberries. 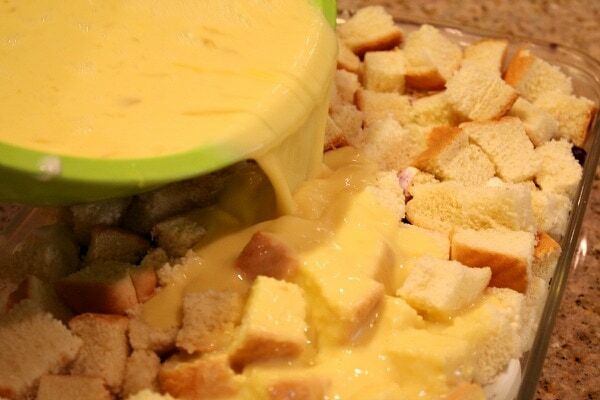 An egg/milk mixture is poured on top of all of that bread. At this point, you’ll cover it with plastic wrap and refrigerate. Do you have to let this refrigerate overnight? It’s covered and refrigerated overnight to let the bread soak up all of that eggy mixture. This is an important step. I like to place a heavy book on top of the plastic wrap- covered casserole so it really gets that bread all down in there in the liquid. You need an overnight soak to really let that egg mixture soak into all of that bread! Can you use frozen blueberries instead of fresh blueberries? Many people have asked if you can use frozen blueberries for this recipe. I don’t really know how to answer that since I have never tried it. My hunch is that frozen blueberries might have a bit too much moisture in them… but I’d be okay with trying it if the blueberries didn’t have big ice crystals attached to them or anything. Let me know if you try using frozen! 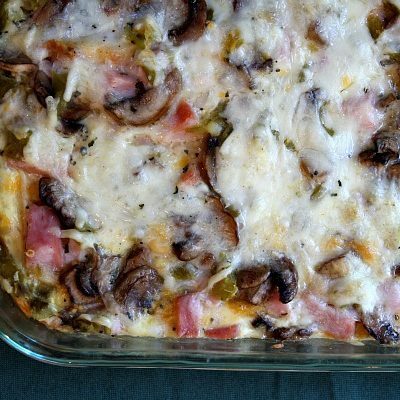 In the morning, you can just take the casserole out of the fridge and bake it. I like to take it out of the refrigerator for about 1/2 hour before putting it in the oven. While it’s baking, you’re going to make a quick and simple, warm blueberry sauce. 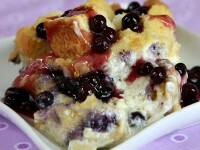 The warm blueberry sauce is drizzled on top of warm pieces of the blueberry french toast . And it’s SO GOOD! This would be the perfect breakfast treat to serve for a holiday brunch or family gathering. It’s special enough for that for sure. I have had this recipe sitting in my email for years… 4 years to be exact! I don’t remember how I came to ask for it. I must have been on Twitter (the big thing back then) tweeting to my friends to send me recommendations for a good brunch casserole for Easter or Mother’s Day. One of my friends really came through for me because this overnight french toast casserole is a big time winner. The recipe comes from my friend Janet (an internet friend for many years who I recently met in person!!) 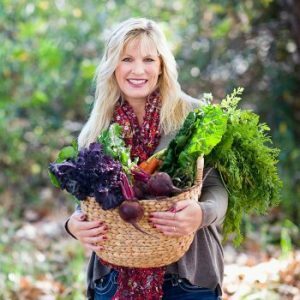 Janet is a majorly talented birthday and wedding cake baker and designer – Luv and Buttah – in Phoenix, AZ. She sent me this recipe in an email many years ago… and I’m finally sharing it with you today! 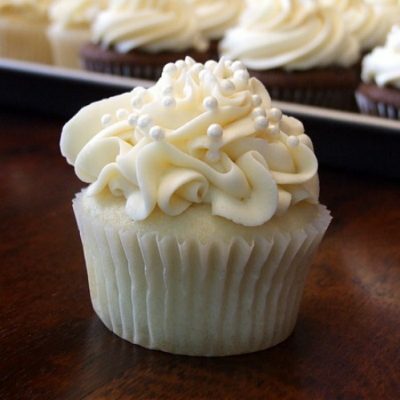 Thank you so much to my friend Janet for sharing this recipe. If you’re looking for more recipes that would be great to serve for brunch, you might like to try my Cinnamon Bun Scones or Susie’s Breakfast Potatoes. Sunday Brunch Cheese Board, Cranberry Mimosas and Brown Sugar Bacon would also be great additions to a brunch! 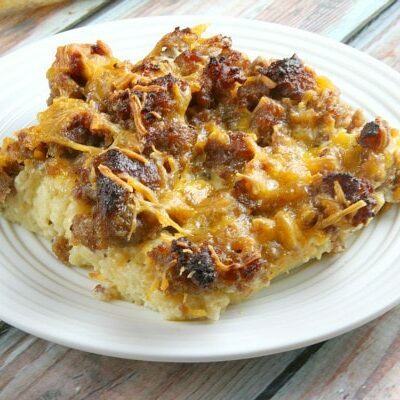 This overnight breakfast casserole recipe is perfect for busy holiday mornings! Spray a 9x13-inch baking dish with nonstick spray and set aside. Cut the bread into 1-inch pieces. Place half into the prepared baking dish. Cut the cream cheese (or mascarpone) into cubes (or scoop with a small cookie scoop) and place on top of the bread. 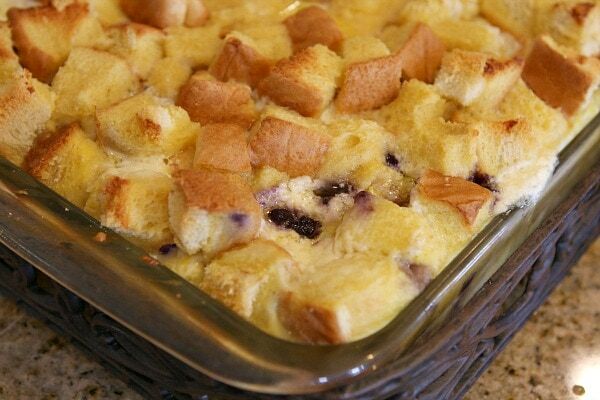 Top with the blueberries and then the remaining bread cubes. Whisk the eggs in a large bowl. Whisk in the milk, vanilla and syrup until well combined. Pour over the bread cubes. Cover with plastic wrap and refrigerate overnight (I like to place a book on top of the plastic wrap to sink the bread into the liquid). The next morning remove the pan from the fridge 1/2 hour before baking. Preheat oven to 350 degrees F. Remove the plastic wrap, then cover with foil and bake for 30 minutes. Remove the foil and bake another 25 to 30 minutes, or until the center is set and color is golden. In a medium saucepan whisk together the sugar and cornstarch. Add the water and bring to a boil over medium heat. Stir constantly and boil for about 3 minutes. Stir in the blueberries and reduce heat to low. Simmer for about 10 minutes or until the blueberries begin to pop. Stir in the butter until melted. Pour warm sauce over individual servings. Do you think you can used the canned pie filling for the topping? Also can you just do no fruit, and maybe add some cinnamon? Maybe– I’m not so familiar with canned toppings. No fruit… might be a little bland? Can we use slice bread instead? How long should it be refrigerated for? French bread would be a good substitute, but I don’t know if I’d usually regular sliced bread. It should be refrigerated overnight– or at least several hours. I made this for my daughter’s wedding shower brunch and everyone raved on how great it was. I used French Bread and cream cheese with fresh blueberries and it turned out great. 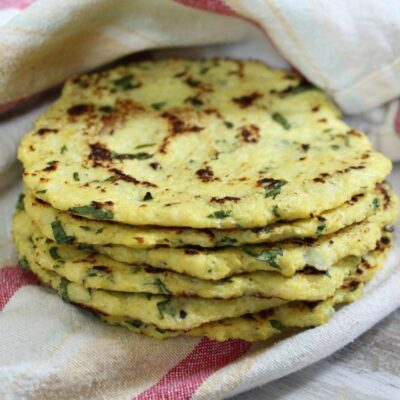 Do you think this recipe could be made 2 days in advance without getting too soggy? I’d be afraid it would start to dry out. For the record — I’ve used frozen blueberries with no issue. It’s yummy and delish. I haven’t tried freezing it!